I feel fortunate to have met the fishing families from El Pardito Island through my ‘day job’ working for Sea & Adventures, an adventure travel company that takes people on kayaking and whale watching trips to remote areas in Baja, Mexico. When I decided to make my first documentary, I felt drawn to the beauty, simplicity and way of life of the folks I met from this island. I wanted to convey, their happy spirit and the tranquility and warmth you feel when you visit this beautiful place. Our lives in the US are often so busy and complicated, but when you step onto this island, all those feelings are forgotten and you feel at peace and warmly welcomed by the people living there. I was also interested in making this film considering the future of this island and whether fishing can sustain their way of life which has been passed down for five generations. Ultimately, I made the film for them and want to give back to them for letting me tell their story. Therefore, proceeds from the dvd will be given to the non-profit environmental group, Niparajá who works with the community to sustain their way of life. After graduating from New York University, Linn worked for eight years as an assistant film editor on feature films and documentaries in Los Angeles. She was fortunate to work in the editing room with such noted directors as Robert M. Young, Francis Veber and Robert Redford. Upon moving to Montana, she worked at a local television station, making commercials and directing a live daily news cast. Ever since studying documentary films with George C. Stoney at NYU, she has wanted to make her own documentary. HERE LIES MY HEART is her debut as an independent documentary filmmaker. Colin Ruggiero holds a BS from the University of Montana in Cultural Anthropology with two minors in Spanish and Latin American Studies and an MFA from the Discovery Networks Science and Natural History Filmmaking Program at Montana State University in Bozeman. Colin lives in Missoula, MT where he is an independent filmmaker. Carlos Gajon Bermudez works as a guide for Sea & Adventures (Mar y Aventuras). He leads groups on the Island Hopping and Baja Coast trips every fall and spring. These trips travel between La Paz and Loreto and when time and weather permit, the groups tour the island of El Pardito. Carlos is a La Paz native who grew up fishing with his grandfather on the Sea of Cortez. He is also an avid surfer and father to Carlos Jr. He self taught himself English through guiding and watching American movies. Amy Hudson Weaver works for Niparajá in La Paz, Baja. She lived on El Pardito island while conducting her studies in fisheries. She got to know the families from the island very well and considers them part of her family in La Paz. She’s an American that lives full time in La Paz and is fluent in Spanish. She was instrumental in helping with research, translations and communication between the families and the director. 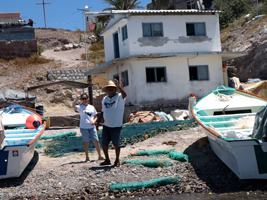 Roman Cahero works as a guide for Sea & Adventures (Mar y Aventuras) and leads groups with Carlos Gajon between La Paz and Loreto, visiting the island of El Pardito. He came to the US to help in the editing room with translating, fine cutting and narration. Angel Leon has worked for Sea & Adventures (Mar y Aventuras) for over 15 years as one of their most competent skiff drivers. He grew up in a small fishing community not far from El Pardito island. His talent for maneuvering the skiff to get the shots needed was a great asset to the production. Mary Harter is the owner of Sea & Adventures based in Bozeman, Montana working closely with her partner Ricardo Amador who runs Mar Y Aventuras in La Paz. Since 1993, they have been doing kayaking and whale watching expeditions in Baja, Mexico. Mary helped the director with her insight and knowledge of Baja as well as the folks she’s come to know from doing trips to El Pardito island. Since 2001 Renee Gavin has worked in the US booking office for Sea & Adventures helping guests with their travel plans to Baja, Mexico. She was a great asset to the producer/director when she needed extra help and input about the film. Los Grandes del Pardito grew up on the island of El Pardito and now live in La Paz, pursuing their musical careers. They have produced two CDs and tour throughout Mexico.